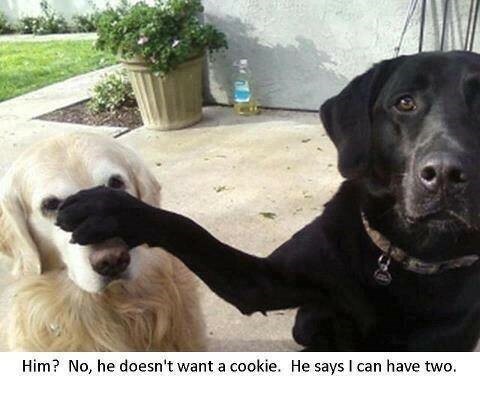 Forgiveness and Love at Home. 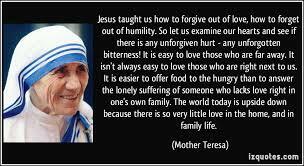 Mother Theresa continues, “It is easy to love those who are far away. It isn’t always easy to love those who are right next to us. I think that I have been guilty of giving charity to “kids in Africa” or “kids in Peru”, instead of loving my own family the way that I should and the way that they need me to love them. When I give to kids in a distant country, I do not have to put effort into a real relationship, and I am protected by distance. However, there was a special case when I had the opportunity to interact directly with two homeless people, a man and a woman who were married and living outside on the streets. I talked with them and gave them money, a tent, sleeping bags and food. I did not do a good enough job of speaking to their spiritual needs, their loneliness and their emotional pain. I was homeless myself for one year and I know what their pain is. I believe that I did my best to help them at the time. My goal was to show them that I would go out of my may to love them, in the brief time that we had together. But it was not enough, and I felt frustrated and sad for them and even powerless. I found out several months later that the woman died. We never know what impact and how important a brief encounter can be with another suffering human being. So let’s love one another, like it is their last day, or like it is our last day! Remember, every one of us is connected to every other human being on the planet. When we love another person and make an impact on their life, our positive energy radiates outward to even more people, like the ripples from a stone thrown into a lake. Love is the language of the soul and it is our best way of making a real difference in another human being’s life. We can touch the hearts, minds and souls of the people in our life, and then see those lives touch countless other lives, and we watch as love flows out like a great river, to touch all of us! Forgiveness will break your chains of resentment, anger and rage. 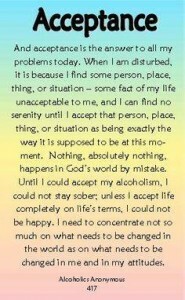 Forgiveness and acceptance are two keys to freedom from addiction. 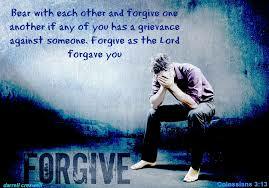 Forgiveness is one of the most powerful spiritual healings that a human being can experience. 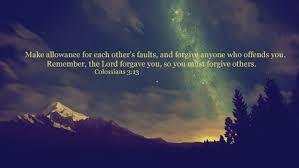 I am talking about both being forgiven, and forgiving others. Addicts use chemicals to feel better or to feel differently or not to feel at all. The experts call it “self-medicating”. In high school, I did not know it at the time, but I was a manic depressive or bi-polar person. My moods moved from high energy manic periods, followed by mild depressive episodes. Although I was achieving straight A’s in school and I was involved in school sports, I always felt like I did not “fit in”. I felt like I was on the outside looking in through a glass wall, separated like someone in quarantine. I was always chasing after people’s approval, like my teachers, my football coach and my family. I drove myself relentlessly in academics and sports to compensate for an unstable alcoholic home. If I could excel in sports and academics, then my life would be O.K. and I could overcome that queasy sick feeling in the bottom of my stomach, which came from the insanity and secrets about my mother’s alcoholism. In my sophomore year in high school, I found the answers to my searching to be a whole person. I found marijuana and later alcohol. Marijuana both calmed me down, and gave me smooth energy. Alcohol made me feel powerful and it allowed me to express myself and let myself go. I discovered how to self-medicate my manic depression and to lubricate my social interactions. Although I was very out-going socially, I carried a lot of anxiety in social settings and my new friends, alcohol and marijuana, never let me down. When a person starts to use chemicals to change how they feel and change how they interact with their environment and the people in it, they are beginning a journey to hell, called addiction. I had no idea what train ticket I had purchased, and where that speeding train would take me. Fast forward 28 years, and I experienced 13 chemical dependency treatment centers and one year of homelessness living outside on the streets of Denver, Colorado. My manic depression was spiraling out of control as was my addiction to alcohol, marijuana and crack cocaine. Along the way, I encountered violence, two near-fatal car accidents, a near death motorcycle accident and three grand-mal seizures from overdosing on crack cocaine. While sleeping down by the river in Denver, I was attacked by a psychopath who was running at me with two butcher knives and threatening to kill me. My dog Princess saved my life that night. In fact, I now know that Jesus and His angels saved my life time after time. I believe that Jesus has work for me to do. My nightmare can now help other addicts. That’s why I have written over 100 blogs on my website about addiction and recovery. The website is: http://www.dungeontosky.com . Jesus gave me a series of commands to write the story of my life of addiction and recovery. It was one year from the day I received these commands, that I published my book. The name of the book is: “Saved By The Prince Of Peace—Dungeon To Sky”. The purpose of my book is to give hope, encouragement, faith and love to the suffering addict who might think that he or she cannot recover. I am living proof that Jesus can bring us back from the brink of death, to a wonderful life of sobriety and freedom from addiction. Jesus has blessed me with 18 years of sobriety, and I have finally come back to my true self that was lost so long ago. If I can get sober after 13 treatments and homelessness and manic depression, then so can you! 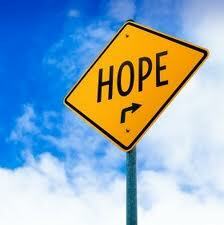 There is always hope with Jesus, and He is waiting for us to come to Him! Addicts self-medicate to feel “normal” again. “I am waiting for you.” Luke 15:11-12″The death of Phillip Seymour Hoffman was a tragic loss. Thousands of addicts die every month, but when someone famous dies of addiction, people finally start to pay attention.He had started out with pain killers and then escalated to the drug that killed him, heroin. Heroin doesn’t discriminate. Its use is up 75% in the past few years. In reality, he struggled with depression most of his life. Addicts don’t want to be addicts, and addicts don’t want to die. Drugs are a symptom of an underlying problem. Phillip’s underlying problem was depression and wanting to feel better. Addicts “self-medicate” to feel normal or to erase the pain that they feel emotionally, physically or spiritually. When I was growing up, I felt different, like I was on the outside looking in. I always wondered if other people felt the way that I did. I later found out that yes, all of the addicts felt like I did. Addicts are willing to go to any lengths to feel “normal” again. Addicts experiment with different chemicals or geographical cures or relationships to keep ahead of the pain that chases them. More than 24 million aged 12 or older suffer from drug addiction – only 10% get treatment. In the past 20 years, the number of addicts in America has increased by more than 500%. In high school, I began to experience the symptoms of manic depression, although I had no idea what it was or how it might affect me. All I knew was that when I smoked marijuana and drank beer, my energy levels increased and I felt powerful and calm. I no longer felt like I was on the outside, looking in. So for me, chemicals made me feel normal, so I kept on doing them. Recovery is intense and difficult and joyous all at the same time. Relapses are part of the disease of addition, but they are not part of recovery. I went to 13 treatment centers and therefore I had 13 relapses. Each relapse was worse than the last one, because addiction is a progressive disease that never gets better, only worse, as long as the addict continues to use. Addiction is like buying a ticket for a long painful train ride that has only one final destination—death. We can get off at any one of the railroad stations along the way, but the longer we wait, the harder it gets. The disease of addiction is like a living, breathing demon that has but one priority—our slow or our fast destruction. Recovery involves forgiveness on both sides and patience as the addict comes out of the grip of addiction. The disease of addiction is mental, spiritual, emotional and physical and it attacks us all at the same time. The effect is incomprehensible demoralization and the overwhelming of our minds, bodies and spirits. We will need healing in each of these areas, if we are to get and stay sober and be free once again. 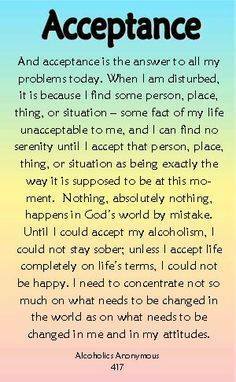 The Big Book of Alcoholics Anonymous points to a spiritual solution for addiction. We had to find a power greater than ourselves by which we could live. The solution to addiction cannot be found inside of us. We have become powerless. “Jesus has given me the strength, courage and faith to move out of this dark place and back into the light of sobriety.” If I can get sober after 13 treatment centers and one year of homelessness living outside on the streets of Denver, Colorado, then ANYONE CAN GET SOBER! I Pray that you will receive Peace, Love and Happiness while you help other addicts to live. Jesus Loves You! Hope, Forgiveness and Love. Jesus is the Way, the Truth and the Life! Hope starts with complete surrender! Peace of mind starts with Hope! Forgiveness is the key to achieving serenity! Jesus is the Way, the Truth and the Life! When I was at the end of my 28 year journey of chemical dependency and manic depression, I had no hope. I was crushed physically, emotionally, mentally and spiritually. I was knocking on Death’s door and I was wild, reckless and dangerous to myself. My soul was like a smoldering dead fire, that ached with every hate-filled breath that I took. I did not even recognize myself, and looking into the mirror was a scary experience. My true self was buried somewhere, miles beneath the destruction and rubble that I had created. I had come to hate myself and to hate the people on the street around me, who desired my destruction and humiliation. The miracle of my final surrender took place in an electrical utility closet in an alley behind my favorite bar, where I slept at night to get away from the murderers, thieves and pschopaths that roamed the night, looking for their next victim. I had been homeless, living outside on the streets for one year. Homelessness, real living-outside homelessness, takes a terrible toll on the homeless person. The first casualty is the body which slowly disintegrates and fades to a mere shadow of its former self. The emotions become high strung and volatile, ready to implode or strike out in anger at any given moment. The mind becomes paranoid and dominated with fear, anger and hate. The spirit becomes crushed and hope slowly dies. One glorious but painful morning, I woke up in the tiny closet and as soon as I opened my eyes, an avalanche of pain, horror, fear, anger and rage crashed into my mind and my emotions and what was left of my spirit. I cried a primordial scream as my spirit finally surrendered to God. In that moment, the scales that had covered my eyes and blinded me to my addiction, fell away and for the first time I could see the destruction I had caused. SURRENDER is hard to do, and for me it took 28 years. As I surrendered to God, I instinctively cried out with a very simple, but powerful prayer, “JESUS , PLEASE HELP ME! With the help of family and friends, two days later, I was sitting in a circle of newly recovering addicts at Hazelden Foundation, a treatment center in Minnesota. This was the beginning my new life of sobriety and freedom. As I began to adjust to civilization at Hazelden and interacting with sober people, I looked around and saw that the other patients were changing right in front of my eyes as their spirits, bodies and minds started to heal. I said to myself, “Hey, if they can get better and if they can find healing, then so can I. I was staring into the face of HOPE and for the first time in years, I saw the possibility that I could recover. I was willing to go to any lengths to get and stay sober. Hazelden recommended that I commit to nine months of treatment — One month in in-patient primary treatment, four months in the in-patient Extended Care Unit and four months in a halfway house. I told them, “Yes, yes, yes, I will do anything it takes to become my true self again, and to achieve sobriety, peace and freedom”. I never wanted to go back to the hell of homelessness and active addiction. The 12 steps of recovery teach us how to come back to our true selves. I have done the 12 steps countless times and they are God’s gift to addicts. The 12 Steps give us surrender, hope, faith, house cleaning through a personal moral inventory, restitution through amends, and finally the gift of helping other addicts, who in turn will help even more addicts. When I did my 4th and 5th steps and my 8th and 9th steps, I uncovered many different types of poisons that were eating me alive. I learned that having resentments is like me drinking poison, and then waiting for the other guy to die! Resentments eat the container that they live in. Resentments were killing me and they helped to fuel my addiction. When addicts feel any emotion, like loneliness, anger, hatred, fear, sadness, confusion, depression or happiness–most of the time they automatically self-medicate and get high to avoid feeling the pain. Addicts are ultra-sensitive. Another amazing thing about us addicts, is that any emotion that we feel, we feel with heightened intensity. When we feel lonely, we feel loneliness in our bones and it aches with a throbbing pain that burns our spirits. When we feel anger, it can quickly escalate to rage. When we feel fear, it can easily turn to terror and paranoia. Sadness and depression can degenerate into suicidal thoughts or actions. When I did my first 4th and 5th steps and took a fearless moral inventory of myself, I learned that as I listed the resentments that I had against my family and friends, when I focused on what “My Part” was in the relationship, I began to see that My Part, what I had done to hurt the other person, was quite big. Then I began to experience an amazing thing. The resentments that I had listed against my father, for example, began to lose their potency when I acknowledged my own faults and transgressions. In other words, I had been carrying severe and long-held resentments against my father, but when I factored in my own terrible actions in the relationship, my anger and my resentments lost much of their intensity. Making direct amends in step nine, helped to repair damaged relationships. FORGIVENESS is one of the most powerful and necessary actions that all addicts need to take in order to win peace, serenity and love. Forgiveness gives us instant peace, instant freedom. We are no longer chained to our resentments, our anger, our lifetime of pain. We used to hold on tightly to our resentments and anger and hurts like they were our prized possessions, until pain forced us into a corner and the time had come to let it all go. We had to give it all to God, so that we could be free, so that we could recover from our addiction. Forgiveness is a spiritual key to freedom. The purpose of the book is to give Hope, Encouragement, Faith and Love to the addict who might think that he or she cannot recover. If I can recover after 13 treatment centers, manic depression and one year of homelessness, then any one can recover! On my website, you will find over 100 blogs on addiction and recovery, a media button that has a video of me telling my story and seven podcast recordings of radio interviews I did all over the country. 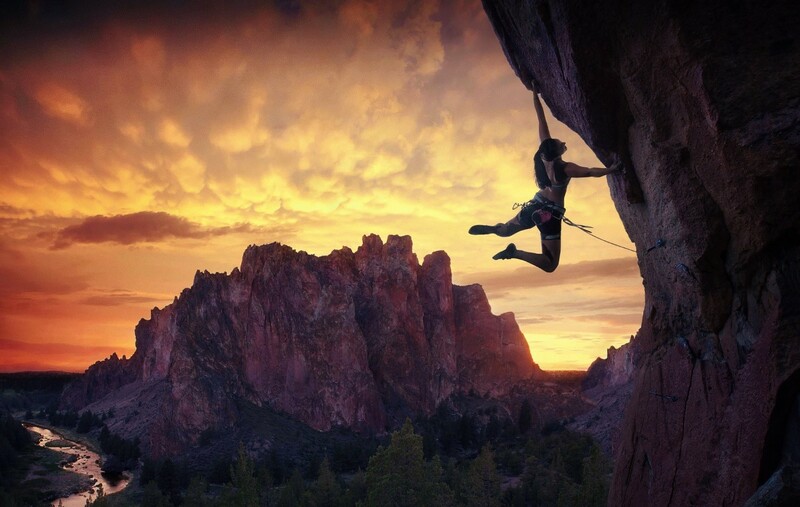 Watching Rock Climbers work their magic, hundreds of feet in the air clinging to sheer cliffs and unforgiving rocks, makes my heart race and my spirit soar. How can they perform such majestic feats of confidence and physical strength. Where do they get their faith? What are they thinking about when they are suspended upside down, hundreds of feet from firm ground? I wonder if they have any fear or if they are able to block out all fear in order to focus on the task at hand. Do their minds ever wander or do other distractions or worries put them in danger. I have experienced a few things in my life that have made me feel like the rock climber. When my wife and I got married in 2002. I felt like I was embarking on a grand journey to the unknown. I had great confidence, some strength and a good amount of faith. I have never felt the joy I did on Rochelle’s and my wedding day. I had so much fun that I asked Rochelle if she wanted to get married all over again the next weekend. When my parents died I had some fear, confusion and loneliness. Who would I confide in, and who would give me love and guidance? Who would be proud of my future accomplishments? I felt sad that they would never see my grandchildren. At the end of my devastating 28 year battle with chemical dependency, I was facing a crossroads. I could die or I could have the courage to go through the pain of recovery. I chose recovery because I still wanted to live, and most powerfully, my mother’s words echoed back to me over the years: “Bob, some day you will recover!” I had the courage and some strength, but I was sorely lacking in confidence and faith. It was my mother’s faith that turned me back to God. 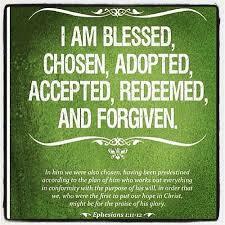 This was my final surrender and Jesus changed my life forever. My life has been restored. I am coming back to who God wants me to be. I have an interest in helping other addicts to achieve sobriety. I am now understanding how my experience of addiction can help to save the lives of others. God is doing for me, what I could not do for myself. See Big Book of Alcoholics Anonymous page 84…. “the promises”. So today, I do have confidence, faith and strength, thanks to Jesus and the love of my mother. I was encouraged by Jesus to write and publish my book, “Saved By The Prince Of Peace—Dungeon To Sky.” The purpose of this book is to give hope, encouragement, faith and love to the addict who might think that he or she cannot recover. My book covers my 28 year battle with addiction, my final surrender and my recovery. On the website, I have written over 100 blogs about addiction and recovery. The book can be purchased on my website, through Amazon.com, Barnes & Noble and Kindle. Check out my book, it is helping to save lives! You can face any journey when you have your best friend. It is amazing to think about the innocence of youth, and our blindness as we drag our hopes and dreams and ambitions into the future. When I was in grade school, I had my eye on the next step—high school. All during high school, I was preparing for the next step—college. When I was in college, I was focused on getting the highest possible grades, so I could get into the best graduate school. My dream of a graduate degree did not happen. I was only able to complete one year of a two year MBA program. If someone had told me when I was in grade school that one day I would become an insane drug addict and alcoholic, that and I would see time in county jails, 13 chemical dependency treatment centers, various hospitals from two near fatal car accidents, a near fatal motorcycle accident, and three grand-mal seizures from over dosing on crack cocaine, I would never have believed them. If I had been told that one day I would be homeless and all alone in a city that was not my own, I would not have believed them. Some days, compared to the innocence of my youth, my life feels corrupted, polluted, damaged, fear-filled, lonely, full of anger and rage, confused, remorseful, sad and depressed, in shock, in despair, hurt to the heart, non-trusting, dangerous. I actually did achieve many of the goals that I set as a young boy. 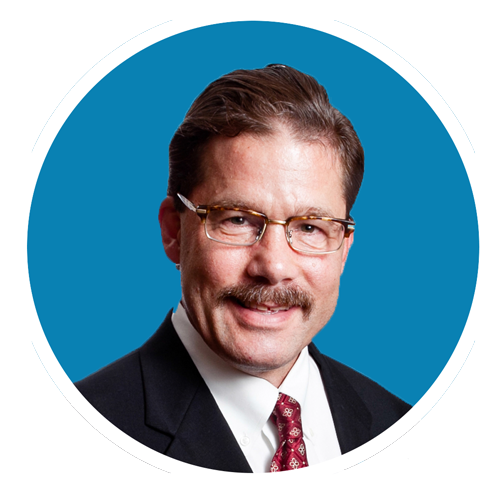 I earned straight A grades in both high school and college, I worked for some fortune 500 companies, I had a very successful career in sales and I have helped a lot of people who were dying of addiction. I have done some volunteer work for the homeless, and I have mentored addicts living in the halfway house that I graduated from 18 years ago. I have made good progress in healing and building up my family relationships. I have helped a young family member to navigate getting sober out of the same halfway house that I went to. I have won the respect of my brothers and sisters, after 28 years of destructive drug addiction and broken relationships. One of my life revelations, is that my pain of addiction and homelessness has a purpose. The purpose of my past is to give hope, love, encouragement and peace to the still suffering addict, who may think that he or she cannot recover. If I was not aware of, or did not accept this life purpose, my life would be meaningless, and I would be devoured by self-hate and depression for the things I have done in the past. Therefore, as rough and painful and horrific as my life has been, there is still hope for me, if I keep my eye on helping others. 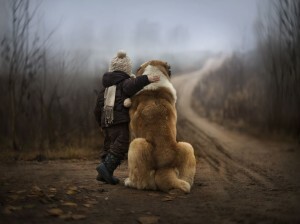 Just like the young boy in the picture, I need a best friend to walk with me on the journey ahead. Although I am just getting to know Him, Jesus Christ must become my best friend. Only Jesus can guide me through the labyrinth of spiritual hurdles and dangers that lie ahead. When I had reached the end of my homeless journey while I was living outside on the streets of Denver, Colorado, I was completely crushed spiritually, mentally, emotionally and physically. I was infested with fear, hatred, resentments, anger and rage. I was depressed and confused and I felt very close to death. It was as if I could feel death breathing down the back of my neck, inviting me to die. 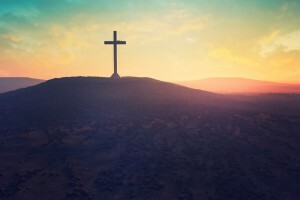 In utter desperation and consumed with fear, I said a very simple prayer: “Jesus, please help me.” That single prayer has given direction to my life for the last 18 years of sobriety. Thank you Jesus. Thank you Jesus. Thank you Jesus! I missed seeing a lot of beauty during my 28 years of active addiction. 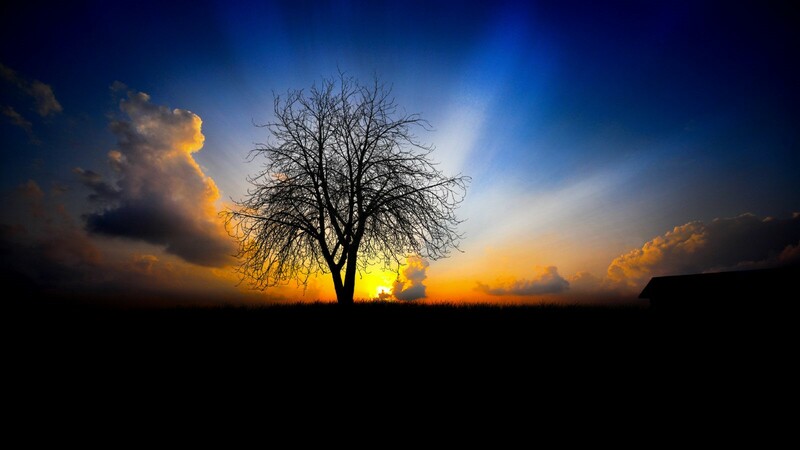 Today, I can appreciate and look with wonder upon the beauty of the tree silhouetted in a spectacular sunset with colors of yellow, white and blue. I believe that when I am close to nature, I am close to God, because God created everything seen and unseen. Chemicals deaden our senses, dull our minds, steal our soul and hurt the people we love. I really feel like I was dead for all of those years when I was chasing after my next high. I was self-destructive and destructive to my relationships. Sometimes, I mourn for all of those lost years, and I wonder how my life would have been if I were not an addict. 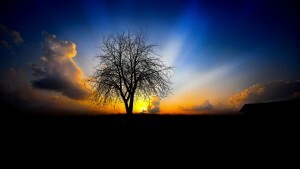 In spite of all of my failures and the pain and destruction of my using days, I remain very grateful to be alive. Today, I can enjoy a spectacular sunset with a clear head and know in my heart that Jesus saved me from death. “If we are painstaking about this phase of our development, we will be amazed before we are half way though. We are going to know a new freedom and a new happiness. We will not regret the past nor wish to shut the door on it. We will comprehend the word serenity and we will know peace. No matter how far down the scale we have gone, we will see how our experience can benefit others. That feeling of uselessness and self-pity will disappear. We will lose interest in selfish things and gain interest in our fellows. Self-seeking will slip away. Our whole attitude and outlook upon life will change. Fear of people and of economic insecurity will leave us. We will intuitively know how to handle situations which used to baffle us. We will suddenly realize the God is doing for us what we could not do for ourselves. Are these extravagant promises? We think not. They are being fulfilled among us–sometimes quickly, sometimes slowly. They will always materialize if we work for them.” Those are the famous AA promises. You can take great encouragement and strength from these words by the founders of AA. They are promises for you and they are promises for me!